Just over a month ago, my family of five returned from a life changing trip to Lusaka, Zambia with Arise Africa. While I could write pages and pages about our amazing expedition, I was asked to condense my words for this post and focus solely on meeting the child we sponsor through Arise Africa’s child sponsorship program. This is like asking someone who’s been to Disneyworld to report on just one ride in the park. Seriously? But because I’ll hear from Alissa if I don’t follow the rules, I will do my best to stay on task. 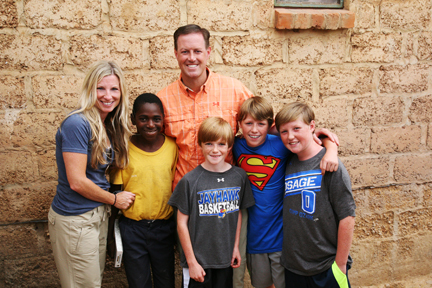 A little over a year ago, My husband and I decided to sponsor a child through Arise Africa. I wish I could say it was a decision that came from the heart, but it was honestly because Alissa point blank sent me an email with a picture of a sweet little boy asking if I would sponsor him. How could I say no to that? Or to Alissa? Don’t get me wrong, I was NOT guilted into doing it. It was just not something that was on my radar at the time. Because, well, life. When we agreed to sponsor our child, Colliard, I had no idea I would eventually be in his home one day or that my children would be playing soccer (futbol) with him in his ‘front yard’. What a difference a year makes. Our first introduction to Colliard, 13, was a hand written letter and a 4x6 photograph sent to us from Arise Africa. We tacked the letter and photograph to a bulletin board in our laundry room as a reminder to pray for him each time we saw his face. Even though I knew what we were doing was a good thing, it was hard to make a heart connection simply from a picture. I couldn’t hear his voice. I couldn’t see him smile. I didn’t know if he was shy. I didn’t know if he had a sense of humor. I just trusted that somehow we were making a difference by ‘sponsoring’ him. What did that even mean? Fast forward 365 days and my family was on a plane (or four) to Zambia. We were told we would be able to meet Colliard once we arrived at his ‘compound’ (similar to a neighborhood, but not at all.) When we drove up the dusty road to the compound and parked the car, my youngest said, ‘There’s Colliard!” I think I laughed out loud because I assumed he didn’t have the first clue when it came to identifying one specific African child in a literal sea of African children. (It turns out, however, there’s a reason he’s in TAG and I was not.) It WAS Colliard! Of all of the (what seemed like 10,000) children that were swarming our car, he was standing right in front of us. And my kids recognized him from a 4x6. There’s something so surreal about going from praying for a child who you’ve only known from a photographic image to actually meeting him in person. No description I write could ever do it justice. I could literally see my children’s brains connecting the dots that THIS is the child who we are helping. This is the child who’s handwriting is on that notebook paper in our laundry room. This is the child for whom we have been praying. My heart almost couldn’t take it. We brought Colliard an FC Dallas jersey as a gift from our family. We wanted something that represented our city, but also something to which he could relate. (Have you ever noticed that soccer somehow speaks the universal language?) He immediately put it on as we awkwardly hugged him one by one. I say awkwardly only because my husband and 2 of my children have personal space issues and to hug them is akin to embracing a porcupine. And really, because what is not awkward about 5 white people whom you’ve never met jumping out of a vehicle excitedly greeting you as if you’ve just reconnected after years of absence. It was like a scene from a high school reunion gone wrong. After recouping from the overly anxious meet and greet, we accompanied Colliard back to his ‘house’ where we met his younger sister, Vida, and his older brother, Gift. We were struck by the visual images that filled our minds on that journey. There were kids everywhere. And kids holding kids. And more kids. Colliard invited us in by pulling back a piece of fabric that acted as a door. I was struck by the darkness of this tiny dwelling, and it took my eyes awhile to adjust to the lack of light. Once inside, the five of us sat on whatever furniture we could find. Colliard’s brother, sister and cousin all joined us along with two Arise Africa staff members for translation. We asked several questions and learned more about this precious family that was quickly starting to feel like our own. It was then that I heard Colliard’s voice. It was then that I saw him smile. It was then that I learned he is shy. And it was then that I learned he does have a great sense of humor. In those moments, he went from being an image on my bulletin board to being a part of my family. After a natural break in conversation, my children asked Colliard if he would like to play soccer outside. We then watched as they quickly integrated with the other children in the compound and played various games with the soccer ball. We were also able to go visit his classroom that day, as well as feed he and his classmates a nutritious lunch. It was by far one of my favorite days on our trip and one I will never forget. We also were able to write in and leave a Bible for Colliard. What does sponsorship mean? It means so much more than writing a letter and sending a check each month. It means touching the life of a child who is in need of education, spiritual guidance, food and hope for a future where the cycle of poverty is broken. The Arise Africa staff has a personal relationship with each child it sponsors. These kids are followed and cared for by loving people doing the work of the Lord in Zambia. I saw it first hand, and pray that this post urges you to consider helping just one child. You may never have the opportunity to meet this child, but I promise you have the ability to change them forever.